Although most people develop and grow 32 permanent adult teeth, many times their jaws are unable to accommodate the four wisdom teeth. 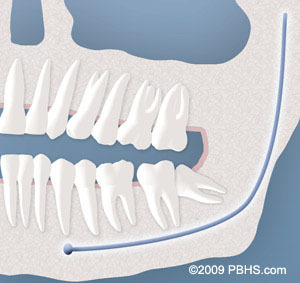 When teeth fail to erupt they are called impacted. This indicates an unfavorable position for chewing and cleaning. A consultation and a special x-ray of your mouth and jaws will be needed to assess your clinical situation and to evaluate for possible wisdom tooth removal. Soft Tissue Impaction: The tooth is partially covered by gum tissue interfering with proper hygiene. Partial Bony Impaction: The wisdom tooth is partially erupted, however, the tooth cannot function properly and the unfavorable position interferes with hygiene. 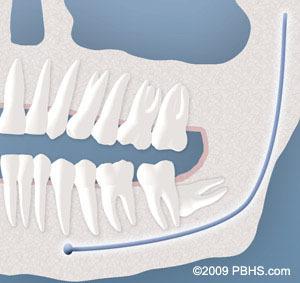 Complete Bony Impaction: The tooth remains embedded in the jaw bone and requires complex surgical techniques for removal.